MediaFoundationDesktopRecorder initializes a desktop duplication session and sends obtained desktop images to H.264 video encoder producing a standard MP4 recording. Optionally, it can add an audio track capturing data from one of the standard inputs. The best performance is achieved when used with hardware H.264 encoder: not only the performance of hardware encoder is better, but additionally desktop images are transferred to the encoder efficiently, without being copied through system memory. With respective hardware, recording is pretty efficient. There are certain limitations: duplication API is Windows 8+, encoder availability depends on hardware and OS versions. The application let API pick encoder automatically and in worth case scenario falls back to software encoder, which is typically a performance hit. When started, the application prints initial information, esp. regarding availability of devices, and appends as actions and events take place. The application uses configuration file with the same name and location as the application, and .INI extension. Changes to the configuration file take effect when the application is restarted. The application registers Win+F5, Win+F8 hotkeys globally to start/stop recording when the application is in background (that is, when user interacts with another application). The application generates .MP4 files in the directory of its own location. There will be a video track, and optionally one additional audio track – depending on settings. Video is taken from one of the monitors, and audio – from one of the available standard audio input devices. When started, the application enumerates (“found video…”, “found audio…”) available video and audio inputs. These discoveries are compared against configuration file settings in order to identify monitor for recording, and possibly audio input device. Default behavior is to take first available monitor, which happens when settings do not instruct otherwise. 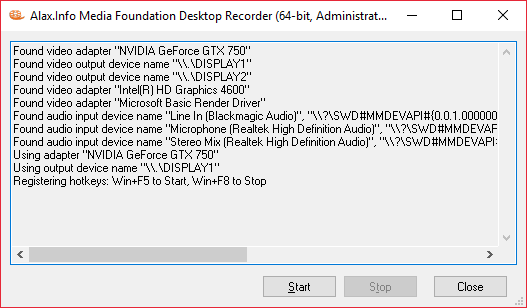 By default, no audio is recorded. Audio is recorded and added to resulting file if input device is provided explicitly. The application also prints which devices are taken for further recording (“using adapter…”). Default behavior is to identify monitor’s refresh rate and produce output file with video at the same frame rate. Video Frame Rate and Video Frame Rate Denominator settings offer an override to target file frame rate. With the former value only, it is the frame rate. With both values they define a ratio, e.g. values of 30000 and 1001 result in 29.97 fps file. Frame rate reduction is a good way to reduce encoding complexity and overall graphics subsystem load. Bitrate values define respective bitrates for the encoded content. As recording goes, the application grabs new desktop snapshots and sends them to encoder. There are no specific expectations about frame rate stability and reduction in case of overload of graphics subsystem. When the complexity is excessive, it is expected that some frames might be lost without breaking the entire playability of the output file. When started the application might experience a condition when certain hardware resource is no longer available, e.g. the desktop itself is locked by user. The application will close the file, and attempt to automatically restart recording into new file. The attempts keep going until user explicitly stops recording. There is no source code available to public for this application, sorry for this.